The French Air Force (Armée de l'Air) started qualification trials of the Airbus Helicopters H225M Caracal Combat Search and Rescue (CSAR) with the latest addition to the French Navy (Marine Nationale) fleet: the head of FREMM Frigate class Aquitaine delivered in November 2012 by DCNS. The Caracal, belonging to escadron d'hélicoptères 1/67 Pyrénées (belonging to the air force but with a joint component because the unit has army and navy personnel too), specializing in CSAR and special operation support missions conducted several landings and take offs from the Aquitaine frigate. The certification is an important step because it confirms that the helicopter can operate safely with the FREMM frigate. It is used to validate procedures between the crews. 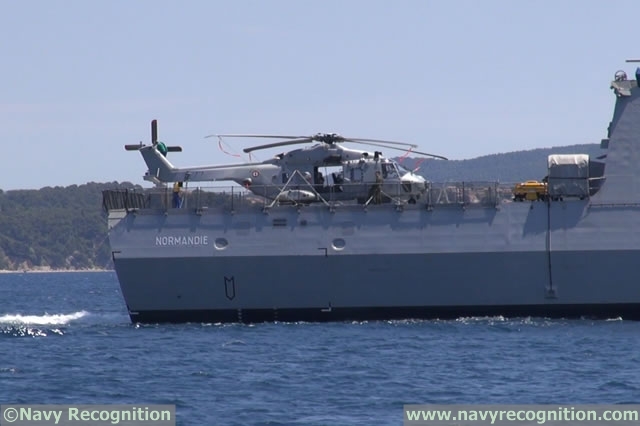 Once the certification completed, Caracals will be able to land on any FREMM Frigate of the French Navy for various tasks: replenishment at sea, transfer of personnel, search and rescue and even special operations (as the FREMM have the accommodation for special forces personnel). 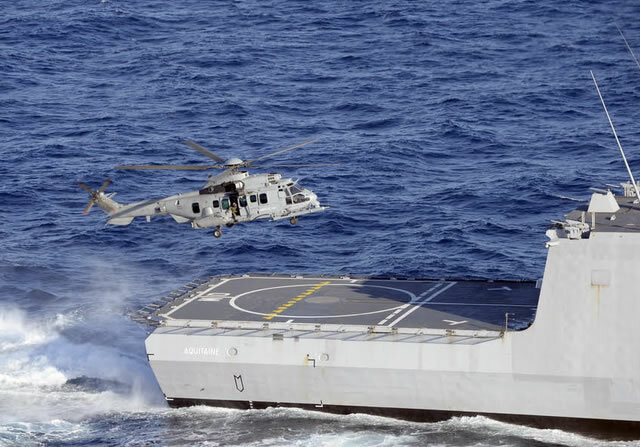 It is not the first time that the Caracal operate from a French Navy vessel however. 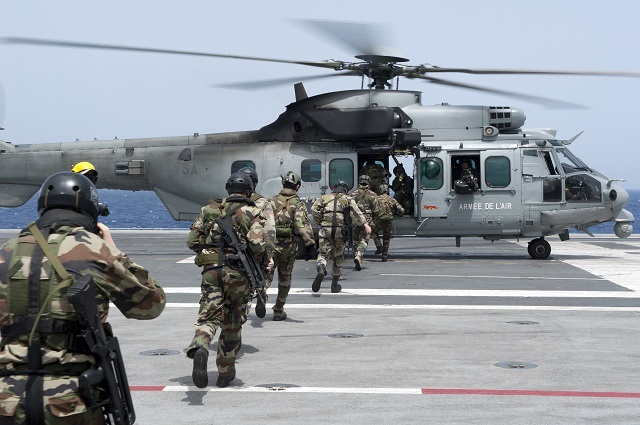 The French Air Force CSAR helicopter regularly deploys on board the aircraft carrier Charles de Gaulle or on one of the three Mistral class LHDs during active deployments. Some H225M customers intend to use the Caracal for maritime roles. It is the case of the Brazilian Navy. Poland is also in the process of procuring the Caracal and some of them will be used for ASW missions, deployed on board surface combatants and will be specifically fitted with a folding tail and rotors. The French Navy will use the NH90 NFH from its Aquitaine class Frigates for maritime security, ASW and SAR missions... and down the road for ASUW missions with the new ANL missile. 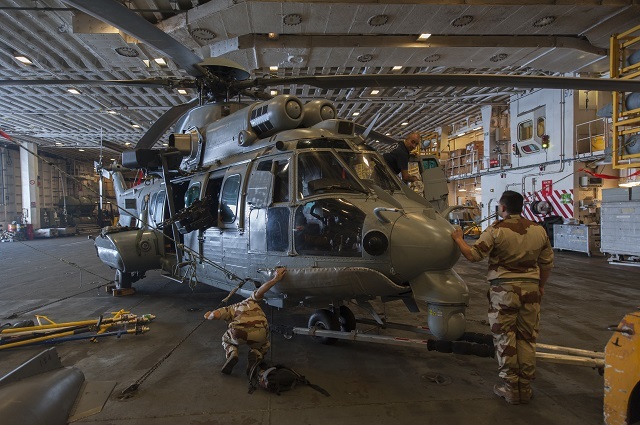 A French Air Force Caracal helicopter in the hangar bay of aircraft carrier Charles de Gaulle. 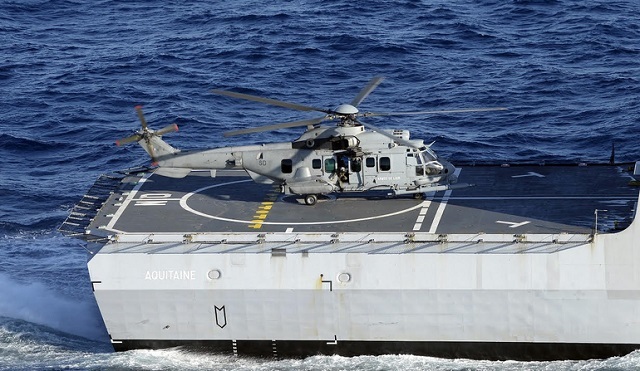 June 2014 picture showing an NH90 NFH Maritime Helicopter of the French Navy on board former FREMM Frigate Normandie. The vessel was transfered to the Egyptian Navy in June and re-nammed Tahya Misr (Long Live Egypt).